A daughter follows Dad’s footsteps—on mountain paths and the printed page. OF COURSE HIS FEET found the mountains. Striding into the Jémez backcountry, Herbert Ungnade could finally recall the beloved Alps he fled at 20 years old when 1931 Germany grew too cold, too cruel. So many years later, whatever troubles he had abandoned went awkwardly unspoken in his Los Alamos home. His roots would sometimes show at the family’s dinner table, with dishes like sauerbraten and spaetzle. Or he would play a little Schubert on the piano. But those mountains! Surely he thought they were lost forever when his parents moved the family from their home near Munich to the middle of Missouri. He drew closer to his high-altitude dreams after earning a chemistry doctorate and scoring a teaching job at New Mexico Highlands University, with the Pecos Mountains conveniently close. In 1953, he gained clearance for a job at Los Alamos National Laboratory and delightedly moved his young family to the heart of the Jémez Mountains. Ungnade (pronounced ung-an-ah-dee) built a new life in this new land. In the thin air, amid the forest green, he explored trails, made mountaineering friends, and taught little Liesl, his only daughter, to scramble up her first peak when she was but in grade school. “Your mother feels like cleaning,” he would say. “Wanna go for a hike?” Consider those words the magical motto for a happy childhood. All too soon, the happiness ended—sadly, brutally, with one remarkable legacy left behind: the first comprehensive guide to hiking the peaks and valleys of an adopted land that had proved itself utterly enchanting. For those who placed their faith in -woolen socks, canvas knapsacks, and a good sweat on a cool day, Ungnade’s Guide to the New Mexico Mountains remained popular and in print from 1965 until 1988. Other guidebooks eventually came along, as did topographical maps, GPS devices, and downloadable wilderness apps. By then the trailblazing author was long gone, killed on one of his favorite mountains just weeks after his book’s debut. His teenage daughter soon grew up, left Los Alamos, and, recently, rediscovered her father’s trove of sketches, handwritten notes, maps, and photographs. Liesl Ungnade thereupon dedicated herself to stirring her father’s memory with new interpretations of his words and images. “When I first thought about reissuing his book,” she says, “I figured I’d type in the old one and make changes. How hard can it be?” She soon learned that the heart of New Mexico isn’t so easy to pin down, and that the journey may render joy with a poignant hue. IN GERMAN, the word sehnsucht defines a deeply held sense of heartsickness that no English word can adequately convey. It blends the words for yearning and illness and implies a lifelong search to repair something impossibly broken, perhaps even to achieve some mystical high ground. With roots that are muddier than regret and deeper than nostalgia, the word has inspired German poets and composers, and could be what drove Ungnade to aim his 1954 Ford down interesting-looking dirt roads, toward petroglyph-rich rocks, to unmarked trails all over New Mexico. With both a scientist’s curiosity and an artist’s soul, he jotted notes and drew pictures of where he and Liesl were, how they got there, and what they saw. His destinations were pretty much of his own design, aided by word-of-mouth wisdom from other scientists who helped form the Los Alamos Mountaineering Club. In the 1950s and ’60s, peak bagging required an air of devil-may-care. Topographical maps were rare. The only comprehensive trail guide for the Southwest was Robert M. Ormes’ Guide to the Colorado Mountains, which included the 14,000-foot-tall ones known as fourteeners. People like Ungnade crested them using gear that was, by today’s standards, laughably rudimentary. Once atop, they sometimes added their names to lists tucked into old pickle jars. Back at home, Liesl would do her homework as her father transcribed his notes and drawings, fountain pen scratching on onionskin—Pecos petroglyphs, the Organ Mountains, Ship Rock, the Brazos Cliffs. Eventually, Ungnade had enough notes about the Jémez Mountains that he proposed pulling together a guidebook. Allan Swallow, who had published Ormes’ book, said he would consider it—if Ungnade expanded the theme. “I appreciate you just wanting to write about Sandoval County,” Swallow said. “But there’s not much in New Mexico. Do the whole state.” How many mountains could we have? Quite a few, it turned out. The state has 100 mountain groups—more than Colorado—ranging from solitary peaks to crowded ranges. Ungnade charted a then amazing 73. One July day in 1965, a box arrived at the Ungnade home stuffed with 232-page, green-jacketed books, each holding a surprise: a dedication to Liesl’s mother, Paulina. “Tears of joy,” Liesl remembers. Book signings followed, but Herbert told Liesl he would sign hers with something special later. First, he had an adventure: an August 14, 1965, trip to what would be his 54th fourteener ascent, South Maroon Bell, in Aspen, Colorado, with four Los Alamos friends. On the appointed day, one of the hikers chose to nurse a sore shoulder at their base camp. The other four headed out early, with one of them wearing an unusual piece of equipment—a construction helmet. They hit the summit by noon, as planned. Coming down a couloir between two sun-slushed snowfields, they roped themselves together (questionably so, some would later say) and tried to manage the long, steep stretch. One man fell. “He tried to dig in but couldn’t,” Liesl says. Four men strung together began falling down 1,500 feet of loose rock. Struggling to hang on to the rope, Ungnade felt it snap. He landed in a crevasse. Two men died on impact. The kid in the helmet survived, although he suffered a concussion. Hearing Ungnade’s cries for help, he made it back to base camp to muster a rescue. At 2 a.m., a helicopter pulled out Ungnade, who died before the chopper could land at Aspen’s hospital. He was 54 and left behind a wife, a 15-year-old daughter, and a four-year-old son. The tragedy stunned Los Alamos and mountaineering groups across the nation. Liesl compares the mood on the hill to that of the days following President Kennedy’s assassination. Funerals were held, mountain climbers invested in proper helmets, and Ungnade’s book developed a life beyond his own. “The royalties kept coming for years,” Liesl says. While working as a legal nurse consultant, she dove into research on towns and attractions to buttress her father’s descriptions of mountain groups, aiming for a travelogue feel. She put together a comprehensive website, nmmountains.com, while compiling her own book sections on New Mexico history, geology, climate, wildlife, and archaeology. She mined his old photographs to punctuate the pages, adding some of her own. 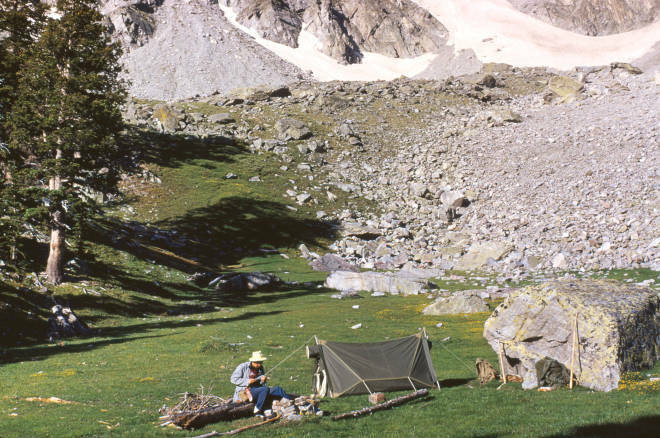 The vintage ones of the Ungnade family camping and hiking hold a particular charm—albeit with a melancholic tone. Paulina died in 1997, a widow of 32 years. On the page, she and Herbert remain forever young, always adventurous, and absolutely unaware of how short their time together would be. Released in 2016, Liesl’s 50th-anniversary edition of Guide to the New Mexico Mountains earned a finalist nod in the New Mexico/Arizona Book Co-op Awards. At 351 pages, it packs a lot of information, but she cautions that it is not a trail guide. She plans to write two more volumes comprised of all her father’s photographs, drawings, and trail data, though her timeline veered when she returned recently to full-time nursing in Cortez, Colorado. She’s “still driven to keep going,” she says, her father’s legacy now her own form of sehnsucht. While further book adventures bide their time, she tends the website and makes sure to get New Mexico dust on her hiking boots whenever she can. For his part, Herbert Ungnade left one mystery in the natural world he loved. Although rescuers pulled him from that crevasse, his camera tumbled down deeper. If the ice below gently encased it in the half-century since, there’s a chance that his final images of the highest places in New Mexico and Colorado are held within it still, frozen in time, awaiting a daughter’s discovery.